Want voluminous lift and hold without crunchy stiffness? 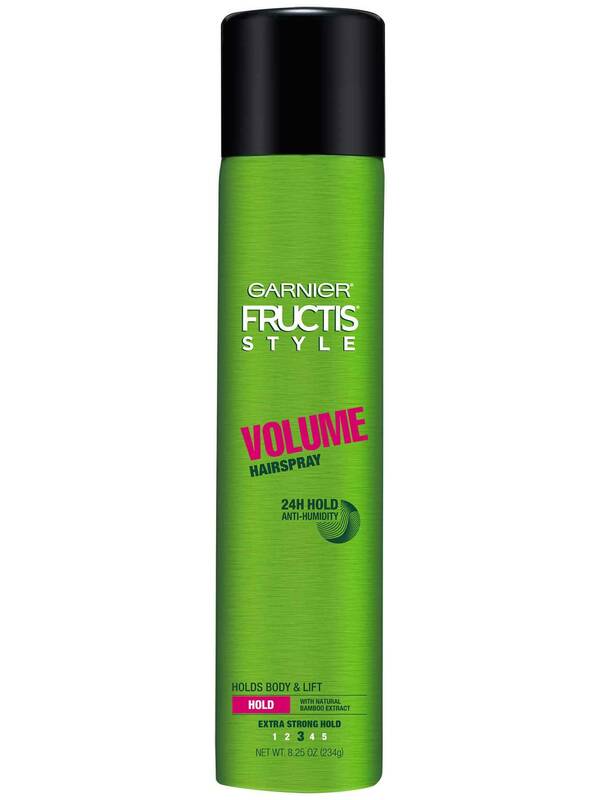 Garnier Fructis Style Volume is a versatile hairspray that provides the body and fullness you need and the natural healthy-looking movement you want. With 24-hour hold and anti-humidity protection, your style stays touchable all day long, even in extreme humidity. Our strong, yet flexible formula, infused with bamboo extract, keeps you in control of your style for 24 hours. This formula works by lifting flat, tired hair from root to tip. Stay in control of your style with extra volume and softness, plus bounce-back hold that lasts all day. Our light, sparkling fruity fragrance will leave your hair smelling fresh and vibrant. Hold can 10 to 12 inches from hair and spray in an even, all-around motion. Spray on dry hair to finish any style. To finish your volumized look, lift hair or tilt head upside down and spray toward the roots. Rated 5 out of 5 by Justgrandmom from Very Good I have extremely fine hair that will separate at the hint of a breeze! This holds well and doesn't make my short, pixie cut hair look like a helmet. I don't know about adding volume, but it works for my needs. Rated 1 out of 5 by Maddy25 from Had to stop using I bought this a month ago. And while it did, for the most part, make my hair hold a decent volume, it was what it made my hair feel like when trying to wash it that made me have to switch back to my old tried and true hairspray. As soon as I started using this product, whenever I would go to wash my hair, even after shampooing and rinsing, my hair felt dry and impossible to comb through (even though I had just finished rinsing it). I tried switching my shampoo, I thought it might be my water becoming hard (but I ruled that out by using my friend’s shower and we’re both on city water) Only conditioner was semi saving it and even then my hair didn’t feel right. But I tested a theory and stopped using this hair spray for a couple days and washed my hair several times and now that I’ve gone back to my old hairspray and this product is now washed out of my hair, my hair is back to normal. Maybe it’s just a coincidence, but I highly doubt it. 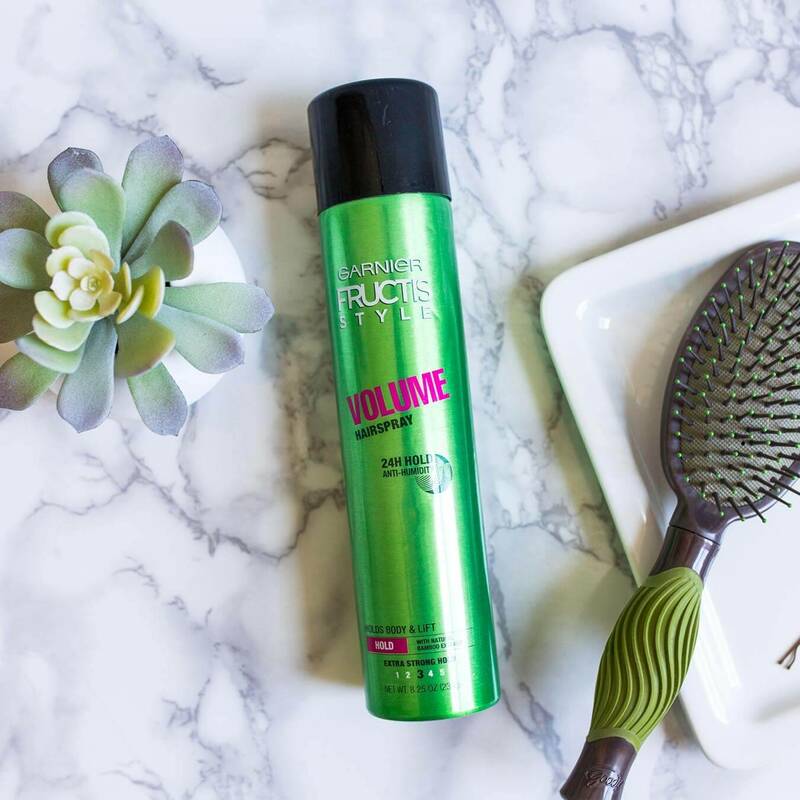 Rated 5 out of 5 by Kristinalom from Garnier Fructis Hairspray First of all, I love the packaging the bright green bottle is very nice with the hot pink writing on it. An I really like the product it really helps volume and it doesn't have a bad smell. Rated 4 out of 5 by StylesbyNancy from It's hairspray I enjoy the light scent of the hairspray. The product sprayed pretty consistently thru the nozzle. I agree that the product provides hold without the crunchy feeling. I do feel that it could have been a little stronger of a hold from this curly hair girl. 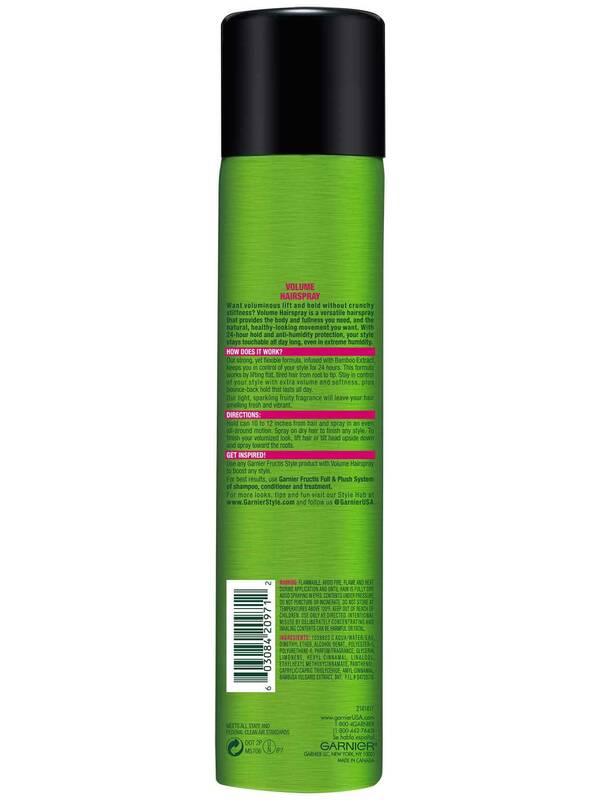 Rated 5 out of 5 by Tgiorgi from Garnier anti humidity volume hairspray I think this hairspray is great.. it’s not a stiff hold (doesn’t make your hair crunchy), it’s just enough to hold the style and prevent the frizz and the smell is amazing! Rated 5 out of 5 by Chel105 from Great Hair Spray! I have very curly, sometimes hard to manage hair. This product was amazing!! And even more perfect that I tried this in a more humid environment and had excellent results. The hairspray hardened but not so much so you could tell it was there ( I don't like when my hair dries and still looks wet due to the hairspray). This product is easy to use, and stays put throughout the day. Another great perk, it's easy to wash out too. I've used products in the past where it feels like my hair is still hard or crunchy even after my shower, not with this! I'll def be purchasing this product again in the future! Rated 5 out of 5 by SarahAO from Great, voluminous hairspray I love the new Gariner Volume hairspray! Not only does it smell great but it adds instant volume to your hair. I recommend following the directions and flipping your hair upside down to add more volume. I wash my hair twice a week, and this is a great pick me up during the mid-week when it starts to go flat. I highly recommend. Ans it smells great.